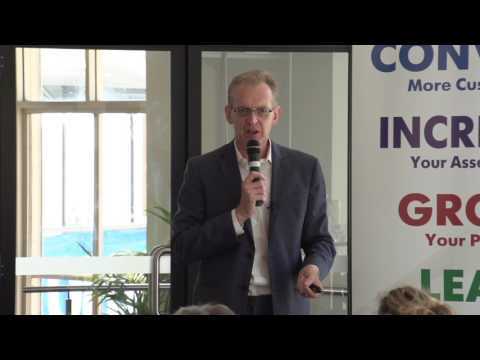 Northern Beaches | How We Increased Our Reach By 800%! 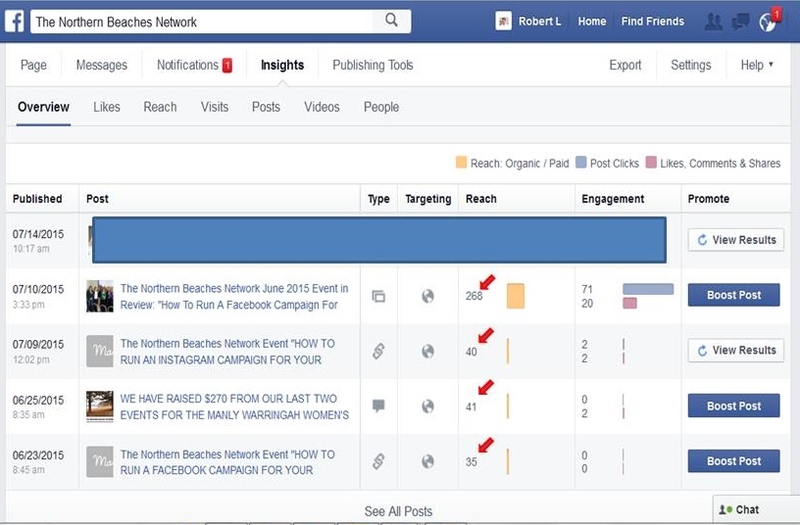 At our June 2015 Northern Beaches Network Event, our special presenter Louise White from White Social I Social Media Boosters made a very valid point that Facebook is primarily now a “Pay To Play” platform. Louise shared the following statistics about Facebook: 10 million daily users; 63% use Facebook to connect with brands and 35% who discover products on Facebook share it with their community and 80% of people access Facebook from their mobile phone. Facebook’s reach is massive. The main difference though between now and from even just twelve months ago, is you now have to pay if you are going to get any traction on Facebook. Gone were the days where you could post something and it would go viral. It is difficult to get any traction for free on Facebook any longer. 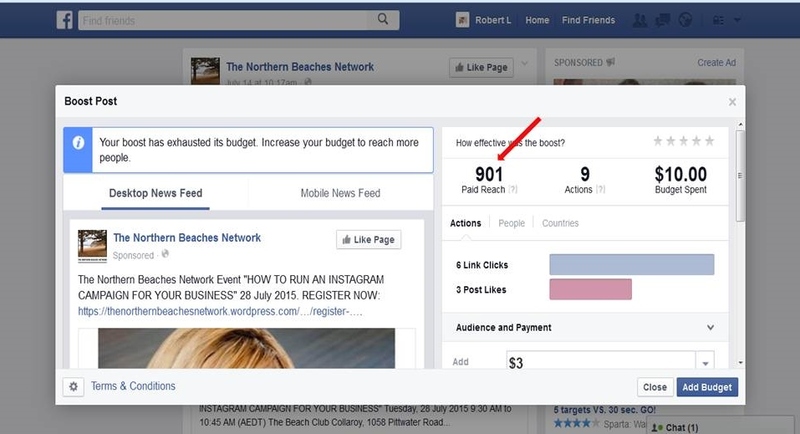 To demonstrate this, I would now like to share with you the results we achieved in “boosting” aka paying to promote our 28 July Northern Beaches Network Event on Facebook. In boosting our post, my aim was to increase the awareness level about the Northern Beaches Network on the Northern Beaches and to get more people to attend our 28 July event. Traditionally, we have always promoted our events organically using our database, LinkedIn Group, Facebook friends and Twitter followers. 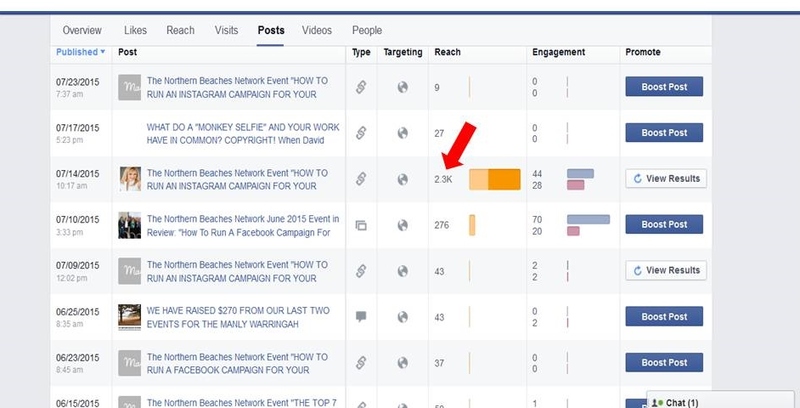 The reach of our previous organic campaigns on Facebook was really quite limited particularly for our earlier campaigns as you can see from the red arrows on Diagram 1 below. 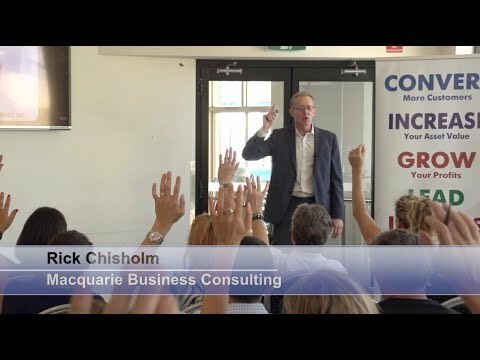 For our 28 July Northern Beaches Event, I decided to boost the event twice. I spent a (whopping) $10 for the first boost. As you can see from Diagram 2 below, this boosted our reach from 268 from the previous month to 901. This is a massive 330% jump on our reach. Five days before the 28 July Northern Beaches Event, I boosted the post for another $5. At the end of the campaign, I had spent a total of $15. 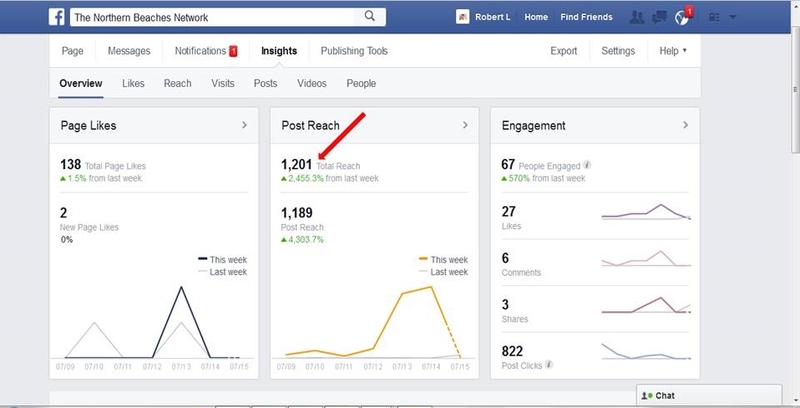 As you can see in Diagram 3 below, the Post Reach boosted to more than 1,200. By the end of the “boost” campaign and as you can see from Diagram 4 below, we had reached 2,300 potential customers. This is more than 2,300 people who received our TNBN post in their newsfeed. You will simply not get this type of localised eyeball advertising for such a low price of $15 in contrast to other advertising channels like your local newspaper. Even if I had decided to run the campaign once a week for five weeks before the event, I would still have only spent $75 and could have reached more than 10,000 potential customers. Based on the number of people that the post reached, we have increased the awareness about the Northern Beaches Network from 276 to 2,300. We attracted five new people to the 28 July event. Although I would have liked to have attracted more new people to the event from our Facebook campaign, to achieve this however, it would require a bigger spend to consistently promote our events over a longer period of time. Depending on your type of business, facebook provides a cost effective alternative to your other more traditional advertising channels. However, before you embark on a paid facebook campaign I suggest that you first formulate measurable outcomes that you want to achieve for your campaign. This should also be part of the overall marketing strategy for your business. This way, you can measure the success or otherwise of your campaign. It is also a good way for you to measure how much it is costing you to acquire a customer through this channel in contrast to other customer acquisition channels like newspaper or radio advertising. If you need help with your Facebook campaign, I suggest that you contact a social media professional like Louise White from Social Media Boosters to help you. Another option is to get a social media professional to help you set up your Facebook tactics and then run the ongoing campaign yourself.